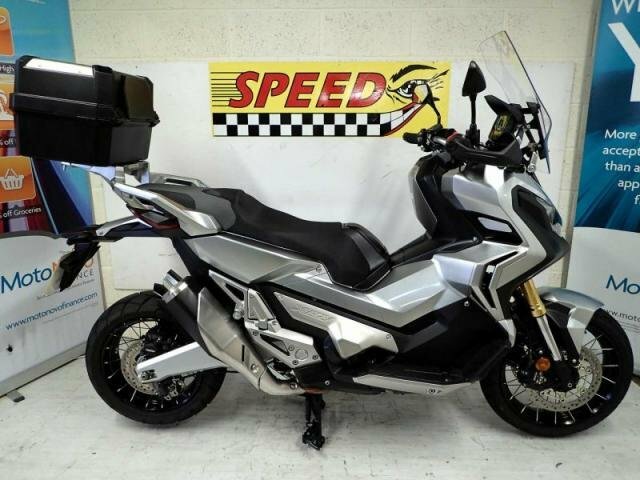 HONDA X-ADV 750, 2017, approx 2021 miles and 1 owner from new.The X-ADV is still a scooter, but thanks to the higher stance and Honda's DCT system it offers a dynamic and fun ride that other maxi-scooters can only dream of. It's engaging to ride and will handle light off-road work should you fancy it. Retail bikes: Competitive finance & great part exchange allowance. Call our team for an easy, no obligation quote. All our retail bikes come with a PDI, valet & 3 months warranty (£75). Delivery in mainland UK from only £125 + VAT. Triumph street 765S, only 159 miles,The seat height on the S is lower than on the RS, thanks to shorter travel suspension. Apart from fitting more people more of the time (it doesn’t change the roomy, comfy, nicely sporty riding position), it also means the S sits closer to the road and feels like it’s being sucked into the tarmac.Retail bikes: Competitive finance & great part exchange allowance. Call our team for an easy, no obligation quote. All our retail bikes come with a PDI, valet & 3 months warranty (£75). Delivery in mainland UK from only £125 + VAT. MV Agusta f4, 14158 miles, Great looking bike,MV’s new- generation F4 is still an unashamed racing bike with lights, but the Italian firm have smoothed out all the old rough edges and created a thoroughly usable superbike for the road. It’s still not as soft or cuddly as a Japanese 1000, but it has considerably sharper teeth and is a thousand times more exclusive and handsome.Retail bikes: Competitive finance & great part exchange allowance. Call our team for an easy, no obligation quote. All our retail bikes come with a PDI, valet & 3 months warranty (£75). Delivery in mainland UK from only £125 + VAT. Get the best deal on a used motorbike for sale in Exeter by making your way to Speed Superbikes Ltd today. You will find every available model listed here on the website, and as all our stock is competitively priced you should have no problem sourcing a pre-owned to suit your budget. Take the opportunity to browse our current range online before contacting a member of the showroom team to find out more. Our friendly and knowledgeable staff will be more than happy to answer any questions and provide advice and guidance when necessary. Alternatively, why not pay a visit to our showroom in person and take a closer look at the selection of used motorbike models for sale.